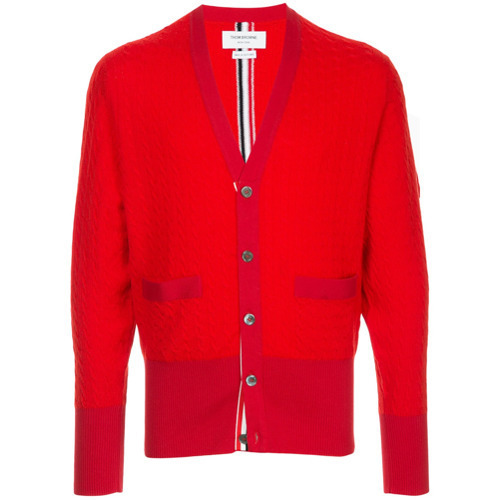 Pair a red cardigan with olive wool dress pants for a classic and refined silhouette. 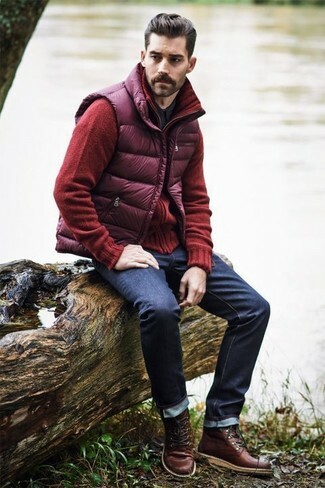 If you're hunting for a casual yet sharp ensemble, marry a red cardigan with navy jeans. Both garments are totally comfortable and will look great together. Choose a pair of brown leather casual boots to show your sartorial savvy. If you're on a mission for a casual yet on-trend getup, make a Thom Browne cable knit cardigan and khaki chinos your outfit choice. Both items are totally comfortable and will look great paired together. 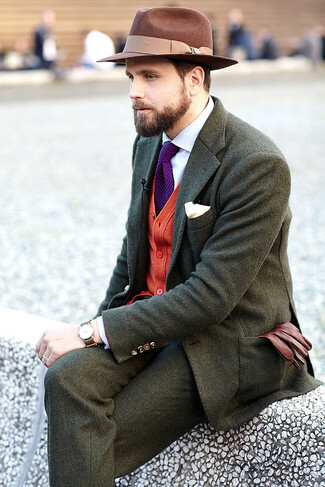 Sporting a pair of dark brown leather derby shoes is a simple way to add extra flair to your outfit. 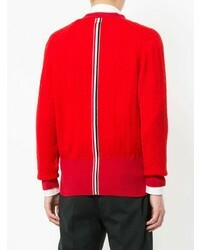 If you're looking for a casual yet on-trend outfit, try pairing a Thom Browne cable knit cardigan from farfetch.com with navy chinos. Both pieces are totally comfortable and will look great together. If you're on the lookout for a casual yet seriously stylish outfit, choose a Thom Browne cable knit cardigan and black skinny jeans. Both items are totally comfortable and will look great together. 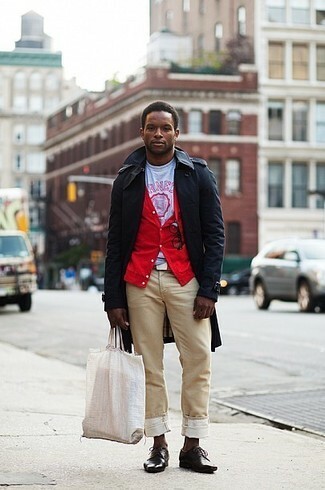 Finish off your getup with white low top sneakers. 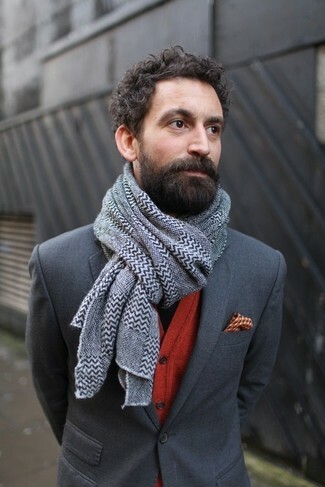 If you use a more casual approach to style, why not try pairing a Thom Browne cable knit cardigan with charcoal jeans? Elevate your ensemble with dark brown leather loafers. 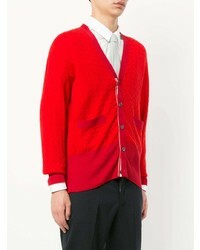 For a nothing less than incredibly stylish outfit, pair a red cardigan with black dress pants. This combo of a Thom Browne cable knit cardigan and a charcoal blazer is very easy to put together in next to no time, helping you look stylish and ready for anything without spending too much time rummaging through your closet. If you're on a mission for a casual yet sharp look, make a Thom Browne Cable Knit Cardigan and blue jeans your outfit choice. 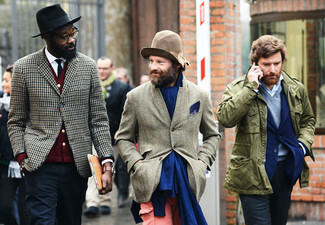 These garments are very comfy and they also look incredible paired together. When it comes to shoes, this ensemble pairs wonderfully with white leather slip-on sneakers.